A guide to implementing the Custom Preflight Checks feature to analyze customer systems to determine if the environment meets the minimum requirements for installation or update. A programmable preflight check is a test that is run before installing and running an application. The test will analyze the system to determine if the environment meets the minimum requirements. Additionally, it’s recommended to specify additional system requirements in the host_requirements section of the application YAML. These host requirements will apply to single node installs, as well as each node on distributed installs. v2.3.0 The application level host_requirements key can be used to automatically upgrade Replicated. This feature can be enabled by specifying a version range in the replicated_version key. Version range syntax is similar to that used by npm. Versions that don’t support this feature will simply ignore the value. This key is also ignored by the pre-flight checks. It is possible to override all properties (except docker version) of the root host_requirements on a per-component basis. On distributed installs, the component host requirements will only apply to nodes tagged for that component. docker_version refers to the lowest acceptable version of docker on the host. 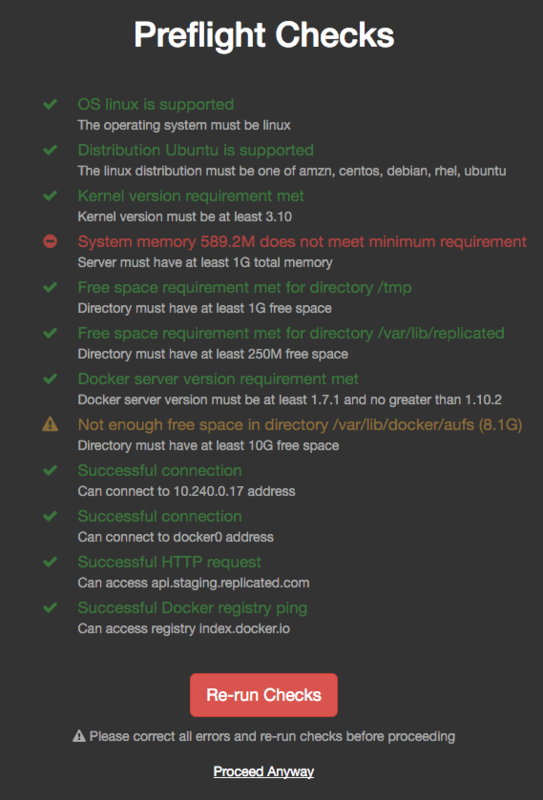 Any host running a docker version at or above this value will meet the requirement. Note that component host requirements are not additive, thus when multiple components are allocated to a single host, each requirement will be evaluated individually. It is also possible to define minimum disk space requirements for volumes on the host machine via the host_volumes property of the component configuration. Replicated enforces these requirements and will not allow the customer to start the application without either meeting these requirements or dismissing the warnings. Upon dismissing preflight warnings, an entry will be recorded in the on-premise audit log. min_disk_space does not guarantee free space, it refers to the disk size mounted at the specified location. The requested docker_version must be one of the versions Replicated supports.